From our planning day I discovered that the children really enjoyed an activity called mini beasts where they go outside, lift up stones, explore and see what kind of “beasties” they can find. As we had been taught that active learning that motivation was intrinsic to interest, I wondered if I could expand on the mini beasts theme. I had a David Attenborough film about spiders making webs playing on the white board throughout the day. The children were free to watch it if they wanted, I didn’t “make” them sit and watch it. It naturally followed that we had a bit of a chat about spiders and webs and it just so happened that two of the boys were wearing Spiderman wellies. I wanted to children to use their large muscles and be quite physical rather than tied to a chair doing a drawing. We out side with some balls of wool, I showed the children how I might try to catch some dinner if I was a hungry spider. I looped some wool onto one side of the fence, let it upwind then looped it on the other side of the fence. The children then got their own ball of wool. What happened next was a blur of wool, excitement and tangled bodies. 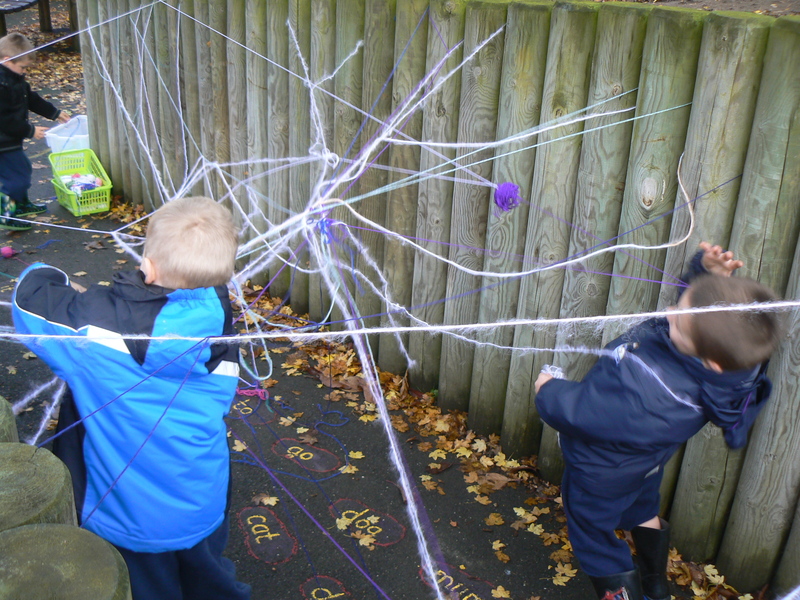 The children quickly worked out their own ways of making a web. It was clear that children really enjoyed the role play element of the activity, being a spider or a fly, trapping or being trapped. They obviously thought I was a fly and we had to get scissors to cut me out of the web at one point. 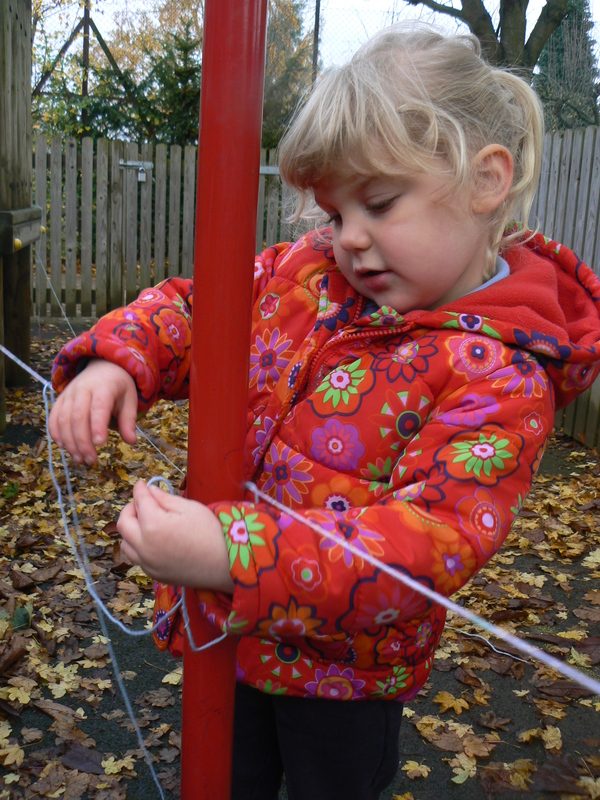 One girl (below) used different tactics and chose a quiet spot to do her own problem solving. She carefully wrapped the wool around the pole, tried, tried and tried to tie it on until succeeding. Proof that everyone learns in different ways and when given the chance can work this own for them selves and reap the rewards. Once back inside and the children had free choice play I could see some of them getting the wool and making webs in-between the chairs! We invited parents to share what we had been being at the end of the day and very delighted how enthusiastic they were to get involved. 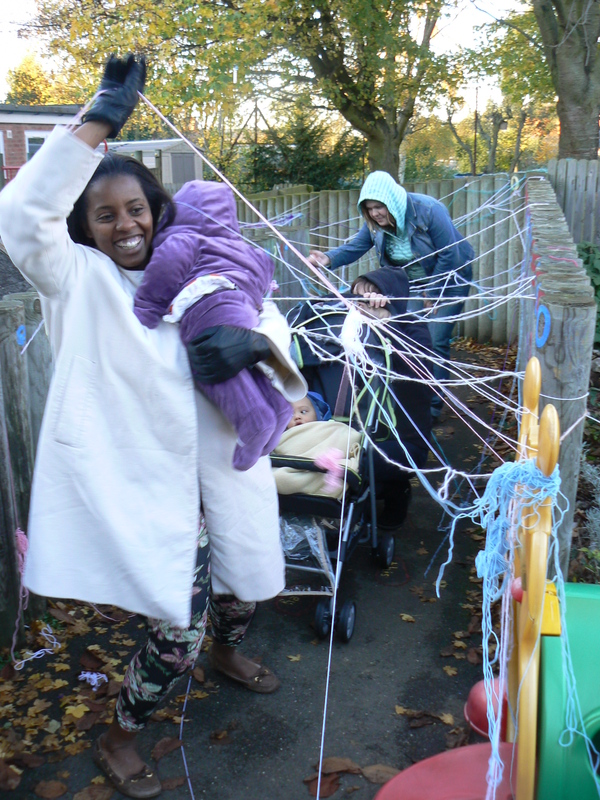 Some parents scrambling through the web with a babe in arms and a push chair. Next up – foaming printing. When I have done this activity before it has been about the outcome, which is usually a pretty marble like print on some paper. As this was an active learning activity it wasn’t for me to say what the outcome would be. 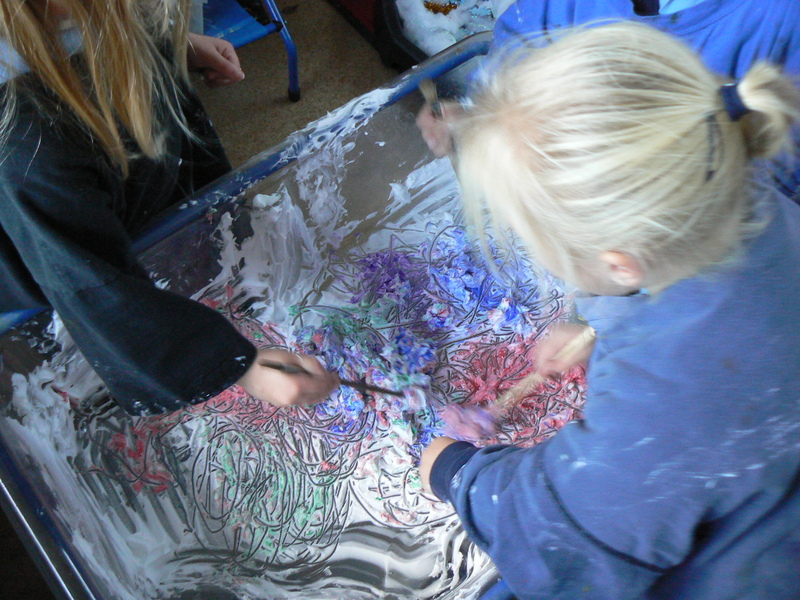 The children seemed to really enjoy the feel of the shaving foam on their hands. They loved mixing the paint in and watching it chance colour. One boy said “can I mix mine in with yours so it changes colour even more?” Another said “it looks like brains!” in fact it did with the swirled paint and pink grey colour. We did make a few prints but it was very obvious in this case that it was the process that was important not the outcome. I think both Ian and I found that time ran away with us and the day was over far too quickly. I will bear this in mind during my next planning session so I can get the best out of the day and not try to cover too much ground. I’m feeling a little uneasy that I haven’t as yet started on a project that will leave a lasting impact on the reception class for years to come; this is probably going to be building something or adding to something already in the outside space. Once I work what it is and start to put the plan into action I think I’ll be able to relax into the project more and not worry about making mistakes or wasting time. I enjoyed my day at the forest school and my first thoughts are that I would like to do some kind of treasure hunt (don’t know what the treasure might be yet) and to build something from sticks for my next delivery session…..